During the lifespan of your tree, it is natural that a variety of factors will weaken its health over time. Storms, wind, and even the growth pattern of the tree, such as growing in a “V” shape or developing long and heavy limbs can affect the structural integrity and overall well-being of your tree. Cabling a tree is generally done within the canopy. An arborist will install cables, often made of steel, between major branches in the tree for added support. This helps to redistribute the stress points inside the tree and supports it from potential damage that may be caused by severe weather. Bracing is done most often in the lower half of the tree and involves the use of solid steel rods. These are placed above and below any area of damage to help repair it and assist with fastening and securing cracks in the trunk or where branches diverge. Bracing is not generally used on its own and is usually accompanied by cabling for added security. 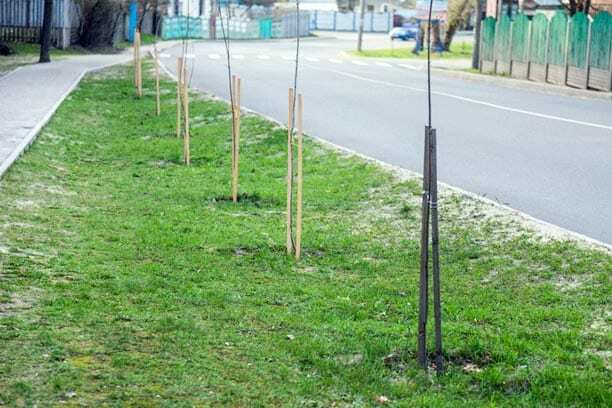 Be aware that cabling and bracing is only a viable option for trees that are otherwise healthy and will be able to recover with the assistance of these supports, or trees that have no current damage and are looking for help to encourage and promote their growth. Lowers Future Costs for Energy – A healthy, strong, and secure tree will mature into a large tree capable of providing shade on the property. This shade helps to reduce the overall cooling costs for home and commercial property owners during the hot and sunny summer months. Along with providing beneficial shade, mature, beautiful trees increase the property value of your land if you plan to sell your home in the future. Encourages the Long-Term Health of your Trees – Protecting your trees with braces and cables helps to prolong their health and lifespan. By cabling and bracing your trees, you help to protect their stability and overall health, giving the tree the ability to continue to flourish for many years. By saving the existing trees on their property, homeowners are able to save any money that may have been needed to remove, repair, or replace those trees. Instead, this funding can be used on other areas of their landscaping or home to improve those. Reduces the Risk of Property Damage and Personal Injury – A weakened or damaged tree can potentially lead to property damage, both of your property as well as that of any neighbouring structures including vehicles, businesses, other homes, fences, and power lines. During storms, this risk increases as strong winds, ice, and heavy snowfall put further strain on the injured tree, leading to increased likelihood of breakage. You may be responsible for the costs associated with the repair. Engaging in preventative measures prior to your tree suffering damage will save you from this financial burden in the future. Call the professionals at DreamWorks Tree Services today at 1-800-407-9917 or contact us online for more information about how to effectively brace and cable your trees. Saving money, being safe, and keeping your property healthy is important, and our qualified team is dedicated to helping you.